Progress offers best-of-breed technology components covered under the A-87 Exception. On July 20, 2015, the Centers for Medicare & Medicaid Services (CMS), the Administration for Children and Families (ACF) and the USDA Food and Nutrition Service (FNS) released guidance to States on the OMB Circular A-87 Cost Allocation Exception. This document clarifies the process to take advantage of enhanced federal funding to modernize and integrate benefits eligibility and administration systems. Enhanced federal funding encourages states to implement and use best-of-breed architecture and technology components across Affordable Care Act (ACA) programs, as well as other benefit programs not directly related to ACA. Examples of covered technology components include client portals, user interfaces and business rules engines. As more and more governmental organizations across the country modernize and consolidate systems to simplify benefits eligibility determination and administration, they’ll need to take advantage of the A-87 exception to upgrade their technology platforms and tools. This will enable a more streamlined experience for citizens, and more cost-effective use of governmental resources. Most importantly, these solutions will enable faster and more accurate distribution of benefits to the people who need them, such as Medicaid and Medicare patients, and recipients of other programs such as SNAP, WIC, and others. Interested in learning more? 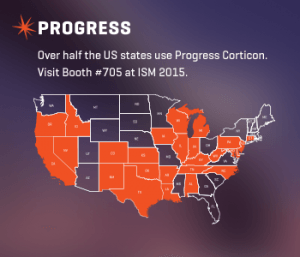 We will be showcasing Corticon at the upcoming APHSA ISM event on August 30-September 2 at booth #705. We hope to see you there. But just in case you aren’t able to make it, hear it straight from Jim Weaver, Deputy CIO at the Commonwealth of Pennsylvania – Department of Public Welfare, in a recent webinar recording. Dr. Mark Allen is a Progress General Manager, dedicated to advancing business automation and passionate about applying technology to improve the world. In 2000, he founded Corticon, later acquired by Progress in 2011. Under his leadership, Corticon became a leading independent business rules platform with hundreds of customers in diverse industries such as financial services, government, healthcare and insurance. Prior to founding Corticon, Dr. Allen developed rules-based systems to help physicians make better patient care decisions. Dr. Allen has a B.S. in Applied Physics from Columbia University, and an M.D. from the University of California Los Angeles.